This is an interactive visual analysis tool that I built as part of Intel’s Local Experiences of Automobility project, using a combination of GPS and ethnographic data, as a tool for studying temporal patterns in drives. The visualization consists of a variety of views on the data, dominated by three timelines. The x axis of each timeline spans a twenty-four hour period, from midnight to midnight. The top (pink) timeline shows all of the participant’s drives for the whole study period, layered over each other with transparency as though they took place on a single day. 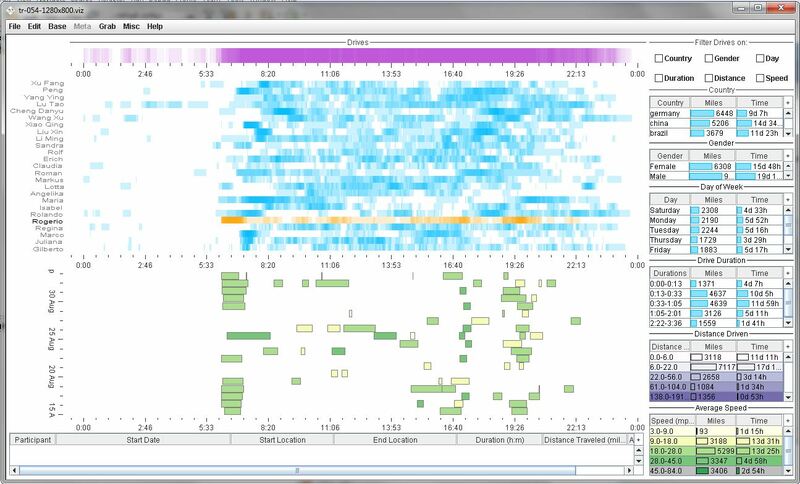 When filtered, this view helps identify patterns across all the participants. Darker areas represent times of day when more drives happened. The second (blue) view shows the drives for each participant, layered with transparency as though all of the drives took place on a single day. Darker areas indicate a time when that participant drove more–often, a morning commute. Selecting a particular participant causes the third timeline to fill. This third timeline shows an individual participant’s drives over the course of the study period. The color of the glyph representing the drive indicates the average speed at which the participant drove. The key for the speed is located in a list on the bottom right. Any of these views can be filtered on a variety of characteristics: average speed, day of the week, gender of the participant, country, etc: these attributes are present in the lists on the right of the visualization. Check boxes at the top right allow the analyst to control to what attribute is being filtered on. Some attributes, such as gender and country, highlight particular participants in the second timeline view. Watch the videos below to see the tool in action! For best results, watch full-size and in HD. In this particular example, we’re exploring the relationship between average speed and country. First, we select Germany from the country list. This causes the German participants to highlight in the second timeline. This helps us distinguish between the drives taking place in China (top of the blue timeline) and the drives taking place in Brazil. Then, we mark the checkbox to filter the timelines on average drive speed. We begin with the lowest speed category selected–3 to 9 miles per hour. As we move up in speed (and down the speed list), you can see that the lower-speed drives are concentrated in China and Brazil–while the highest speed drives take place almost exclusively in Germany. In this example, we’re looking at the impact of gender on driving patterns in China. So, after selecting both China and Female from the Country and Gender lists (causing the participants in China and the female participants to highlight), we select the checkbox indicating that we want to filter on gender and country. Now we see only the female participants in China. In particular, watch the top (pink) timeline, which shows the drives for the female participants in China all stacked on top of each other. Notice that the majority of their driving is done between 7 am and 7 pm. Now, as we toggle to male participants in China, we see that they drive much later at night than the female participants do. It is up to ethnography to answer why this pattern is present. As always, the opinions expressed here are my own, not Intel’s. This entry was posted on June 26, 2013 by Rachel Shadoan in Work and tagged Improvise, visualization, Work.